Avulstein Gray-Mane is a Nord warrior who lives in Whiterun. He spends his time hiding in the Gray-Mane house, afraid that he is wanted by the Imperials for associating with the Stormcloaks. The first time you enter he will greet you with an axe, but quickly calms down when his mother, Fralia Gray-Mane, tells him she brought you there to help. His brother Thorald has gone missing, and Avulstein will task you with finding him. Once you discover that Thorald is being held captive in Northwatch Keep by the Thalmor, Avulstein will offer to come along and help assault the fort. Avulstein wears a set of scaled armor with a matching pair of boots. He is equipped with a Skyforge steel battleaxe, and carries a key to the clan's house, as well as a selection of common loot and gold. 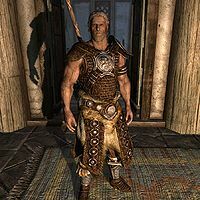 Avulstein is in the housecarl faction and has an unused package to exile him to Viola Giordano's House in Windhelm, indicating that he was once intended to serve as Vignar's housecarl instead of his sister Olfina. This page was last modified on 3 October 2015, at 12:45.